Lanai to most people is called a patio or a porch. The word lanai, according to Wikipedia, originated in Hawaii and describes a type of roofed, open-sided veranda, patio or porch. Lanais in Southwest Florida are for the most part covered by large screen enclosures to keep out unwanted bugs and other animals allowing a property owner to extend their outdoor living space pest free. As it gets dark often times the area of the lanais that extended the farthest from a home have dark unlit areas. These dark areas are created when the attached building lights don’t cast enough light to effectively reach these spots. 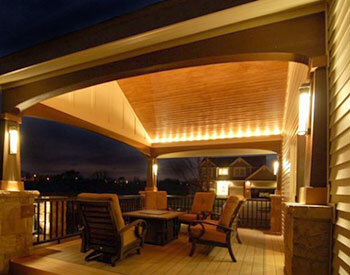 Lanai lighting systems by Coastal Outdoor Lighting incorporates a unique blend of lanai lighting design & elements that comprehensively addresses your building’s architecture, property size, and planned activities. 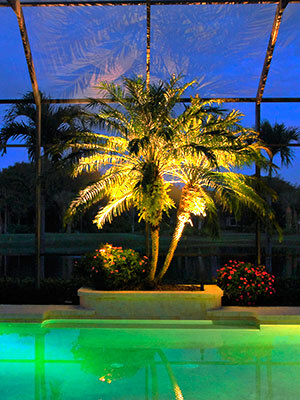 We only use quality lanai lighting components manufactured by top rated companies. As a preferred vendor of these top rated companies our special pricing and support is passed on to you the property owners. When you call our office you will always speak with one of our employees. Every employee drives a fully equipped, professionally marked company vehicle that is computer equipped and networked to your entire project’s design & history. When you call Coastal Outdoor Lighting you can be sure you are contacting a fully licensed and insured Florida lanai lighting contractor. Every lighting design starts with a “Free Onsite Consultation” by one of our trained & certified lighting designed specialists. For the very best in lanai lighting design & installation please complete our online request form or for the fastest response call us today @ (239) 491-6759.